It was a Saturday, my boyfriend and I went to a flea market to some of our friends that were moving from Ecuador to Spain. I was sitting in the car for maybe 30 minutes waiting for my boyfriend to finish some things before we could drive home. We all decided to drive to the food truck area in Quito to eat dinner. We drove for maybe 8 minutes where I experienced the whole car moving for maybe 20 seconds. I told my boyfriend to stop doing that to the car. Then I saw the other car in front of us moving from side to side. At the same time I saw the power lines exploding and all the power went off in the area. People went out of their houses and cars. I didn’t really understood what was going on before I saw people writing about it on Facebook. As soon as we went in to the city centre, we saw that the power was still on. People didn’t seem so shocked as I thought. Some were still outside of their houses, some ordered food at Subway and filled their car with fuel. We were afraid something were ruined in our apartment. When we walked in the door we didn’t see anything else than a few CD’s on the floor. My boyfriend Mauricio told me that an aftershock will probably come soon and we prepared the apartment. We placed the TV facing down on the floor, put stuff inside drawers or on the floor. We were waiting for new information from the local news, but they were late. I started to read Norwegian news were they got more information. On Facebook we were told to be prepared to have shoes and jacket ready, water bottle and flash light next to us at all times. It was late evening and I still couldn’t fall asleep. The ceiling light was still on. Suddenly, around 2 am we felt it again, not as long. We live on the 9th floor and it felt like the whole building was falling to one side. The shock didn’t last as long as the big one, however I was more scared now than earlier. I couldn’t sleep at all and feared another earthquake. Next morning, I saw I got a message on Facebook and it was from CNN! They wanted to interview me and ask about my experiences. I accepted and gave my phone number. The CNN journalist called immediately. I thought it was only for the website or something that will be written, but no. The CNN journalist wanted me live on CNN International through Skype. I felt I couldn’t say no. 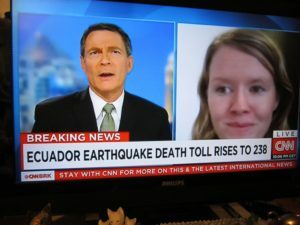 I wanted to give people information on how it was in Quito after the earthquake. I got time to prepare myself to talk for millions of people on skype. 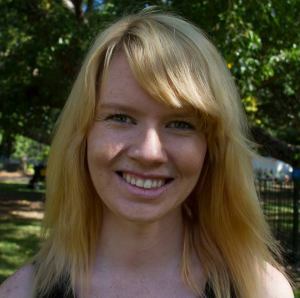 The short interview went on and I explained my experiences. It went better than expected, although I would NEVER watch the interview. Hours later, the death tolls were increasing and I started to get emotional and realised how terrible it actually was. Watching the news where people were crying of losing family members and even their babies, seeing whole towns smashed and seeing people getting rescued. I wanted to do more to help, but it was limited what I could do. Since I am not a trained workind with emergency and rescuing, I would not have get permition to access the epicentre and the worst areas. My boyfriend and I donated everything we could donate – food, water, clothes and blankets. 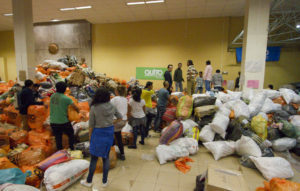 A few days later the donation areas began to grow and needed more volunteers. 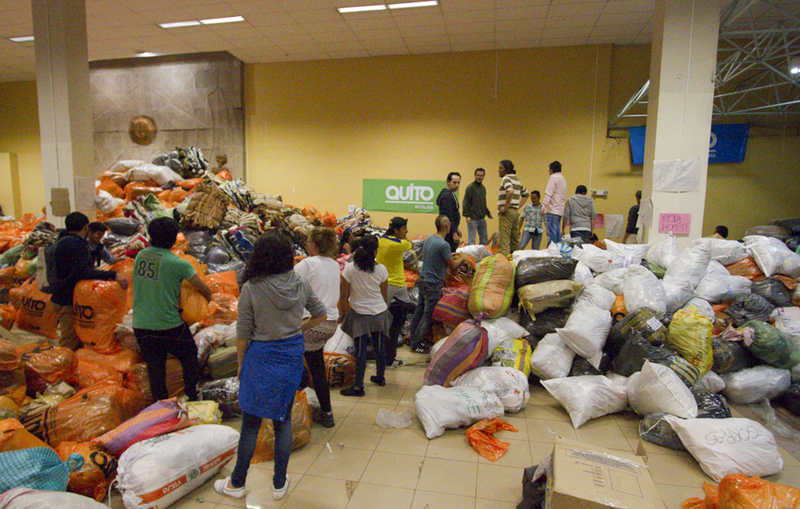 I volunteered for a few hours at the biggest donation place in Quito. Almost 6 months later I have experienced small shocks and I get scared every time. It happens almost once a month. Some of them are big enough to make car alarm go off and people go out to a secured area. Some shocks are small and just for a few seconds where you barely feel it. Earthquake and shocks is something I would never get used to, even though it happens often in South America. Have you experienced an earthquake? How was it?